Ostriches (Struthio camelus) are the world's largest living birds. Categorized as ratites along with the cassowary, emu, kiwi, and rhea, they are fast-running and flightless. Ostriches grow as large as 90 to 130 kg (198 to 286 lbs). They are sexually mature at 2-4 years old, although they are killed for their leather at between 12 and 14 months old. Their wings are necessary for regulating body temperature, courting, and protecting eggs, and their beautiful feathers are remarkable insulators that protect them from solar radiation and reduce heat loss on cold nights. Ostriches can run up to 70 km/h (44 mph) on their powerful legs and hooflike claws (with a stride of 3-5 meters 10-16 feet), traveling long distances for food and water.1 They have the largest eyes of any land animal and their eyesight is acute. 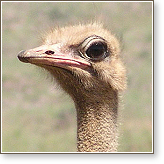 Young ostriches are especially gregarious and live in groups. They are peaceful when left alone, yet can be aggressive in defense and deliver a deadly kick. As these nomadic creatures mature, they live in pairs or in polygamous groups, with both females and males building nests, incubating eggs, and rearing children. Little is known about what ostriches truly need for a healthy diet, environment, and mental stimulation, and those in captivity suffer for it. Some adult breeding pairs or trios are confined to pens 50 by 50 meters (54 by 54 yards); others may be crammed into paddocks with as many as 250 others.6 Birds kept in pens with inadequate space have been observed pecking sand, wire fencing, and each other. Their environment is as barren as cattle feedlots. In a flock of more than 500 ostriches on an Israeli farm, pecking by flock mates caused "moderate or severe feather loss" in dozens of the birds.7 These aggressive behaviors, induced by intensive captive conditions, are never observed in ostriches in their natural habitat. Mass production methods such as artificial insemination, incubation, debeaking, and feather plucking are applied to these birds. Eggs are removed from nests and placed in incubators. Pre-hatch mortality is common: 30 percent of young birds never make it out of the egg, succumbing to diseases brought on by the parents' own poor nutrition or by improper temperature and humidity.8 Without natural parental protection, more than 50 percent of those who hatch die within four weeks from stress.9 Many die from starvation because of poor hygiene or improper temperature regulation in their housing. Poor heating and slick floors also lead to chronic leg deformities. With inadequate stimulation but a high-protein diet, ratites, like all factory-farmed poultry, are subject to digestive attacks, reproductive illnesses, and transmissible diseases like avian flu. Even taking these destructive factors into account, the mortality rate in ostriches is still considered mysteriously high, handlers calling it "fading chick syndrome." Syndicates are frequently formed to invest in breeders or to establish a commercial operation. The investment in breeders is so expensive that a startup ostrich operation is often funded by a government subsidy or grant. Such is the case in China. Ostrich farming was started there in 1992, and China has already become the fifth largest producer in the world. One farm alone, in Jiangmen City, has plans to invest 9 million Euros ($10,500,000) to expand and add a feed processing plant, a slaughterhouse, and a tannery. Annual product sales are expected to be over 30 million Euros ($35,000,000), which demonstrates that the demand for ostrich hide far exceeds the world supply. In fact, South Africa purchases Chinese ostrich hides in an attempt to fulfill its own sales contracts. Since 80% of an ostrich's butchered value comes from its skin turned into leather, they are almost too valuable to be killed for meat, which should come from younger, and therefore smaller, birds.18 One has to question if the slaughtered meat is actually from culled, deformed, and sick young birds who will not attain full size anyway. Ostrich meat is promoted as a low-fat and low-cholesterol healthier meat alternative. Some Israeli restaurants offer ostrich on their menus; however, the non-kosher meat generally is not eaten but exported. Recent outbreaks of Mad Cow disease (BSE) in Europe prompted an increase in demand for the meat. Ostrich meat producers in South Africa, Botswana, Namibia, and Israel are reporting larger orders from countries like Denmark, France, Italy, and the UK.19 One Jordan Valley producer reports as much as 14 tons of ostrich meat exported from his farm.20 Some ostrich enterprises are hoping to be able to develop, through breeding and manipulation, an ostrich so huge that it might yield 450 kg (1,000 lbs) of meat. Most countries have no regulations for the welfare of ostriches, and in some they're classified as poultry, which provides them only minimal, if any, protection. In some other areas where they are classified as exotic animals, attempts have been made to redefine ratites as domestic fowl or poultry, so that inspection standards could be in line with chickens and turkeys and, like them, ostriches would be specifically excluded from humane slaughter oversight. The virus that causes avian flu (H5N1) is carried in the intestines of wild birds, with no effect on the hosts. The confining and filthy conditions in which birds are raised for human consumption, however, has proven to be a breeding ground for the virus. Tens of thousands of ostriches in South Africa have already been slaughtered in an attempt to contain the disease, and the government is trying to stem the epidemic through strict quarantine.21 Since the 1990s, over 150 million birds have been destroyed in Southeast Asia alone in an effort to control the spread of avian flu. The World Health Organization has now confirmed a North and Western spread through migrating birds, and it is closely monitoring the potential for this virus to cross the species barrier to infect humans and cause a highly fatal pandemic. Intensive farming systems and animal densities are significant factors in the spread of avian flu. Presently, high human risk is associated with direct exposure to dead and diseased poultry, mostly during defeathering, slaughtering, and food preparation. 1 M.M. Shanawany, "Recent Developments in Ostrich Farming," World Animal Review 83(1995). 2 "Facets of the Israeli Economy-Agro-Technology," Israel Ministry of Foreign Affairs 1 Jan. 2002. 5 Dr. Joan S. Jefferey, "Ostrich Production," Texas Agricultural Extension Service, 1996. 6 B. Perelman et al., "Nutrition Related Micrognathis in Ostriches," Israel Journal of Veterinary Medicine 56(2001). 7 H.H. Sambraus, "Feather Pecking Among Ostriches Kept in Captivity," Tierarztliche Umschau 50(1995): 108-111. 9 John Adams and Brian J. Revell, "Ostrich Farming: A Review and Feasibility Study of Opportunities in the EU," Harper Adams University College 1998. 10 Vincent Gardener, "Ostrich Farming in South Africa. Based on a Visit to an Ostrich Farm in South Africa on Friday 25 Apr. 2003." 12 Animal Welfare Advisory Committee, "Code of Recommendations and Minimum Standards for the Welfare of Ostrich and Emu," Biosecurity New Zealand Jun 1998. 14 Clayton Crowther et al, "The Effect of Night Transportation on the Heart Rate and Skin Temperature of Ostriches During Real Transportation," Meat Science 64:2003: 365-370. 16 "Guidance on the Slaughter of Ostriches Welfare," Department for Environment, Food and Rural Affairs, 4 May 2005. 18 Nicky Blackburn, "Chutzpah and Initiative Spark Israeli Ostrich Industry," Jerusalem Post Service 23 Jan. 1998. 20 Danielle Haas, "Ostriches Are Export Winners from Foot-and-Mouth Crisis," Jewish Chronicle 23 Mar. 2001.